In any battle between emotions and logic, emotions will always win. My friend was telling me of her brother's concern for his 20-something daughter. The young woman has poor time management skills which make her late for virtually every family function. If it is a "pot luck" dinner, she waits until the day of the function to decide what to bring, shop for the ingredients and begin making whatever it is she's bringing. If she's meeting a family member for lunch, she shows up late. This behavior is irritating her parents to no end, and they don't know how to cope with it. The first thing I asked my friend was how her niece felt about her own behavior...did she seem concerned or feel badly about it. The response was absolutely not. In fact, her niece seemed oblivious to the fact that she was causing problems for anyone. Her own behavior apparently was acceptable to her. "So your niece sees nothing wrong with her behavior?" "No. It doesn't seem to be causing a problem for her at all." said my friend. "So my brother wants to know how we can get her to change." My response was that you can't. Not only can you or I or anyone get another person to change unless they want to, in this case, the young woman was not emotionally invested in changing. Have you ever wondered why people continue to smoke knowing it's bad for their health and there are countless ways to quit? What about people who max out their charge cards and continue to spend. In fact, how can we make sense of anyone who continues a habit that is causing them problems? They know the behavior is bad, yet they just won't stop. The explanation is really quite simple. They are emotionally attached to the behavior. It serves them in some way. Logically they know they should stop whatever the behavior is, but logic doesn't have much of a chance when pitted against emotion. 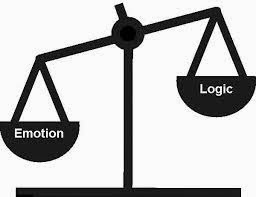 So the next time you know you should change something in your life and you just can't quite seem to do it, remember emotion vs. logic. If you can get yourself emotionally invested in the change, not just knowing that you should but really feeling that you should, you will have a better chance at success.